#sovscup – W M Nixon casts a quick eye over the final outcome of the ICRA Nats/Sovereigns Cup. George Sisk has been an active participant in the distance racing scene for so long that you could be forgiven for thinking that he must have made his first offshore passage with Noah on the Ark. But you'd be wrong in that assumption. A Sisk would never have had to seek a berth with Noah. The family have always had their own yacht. 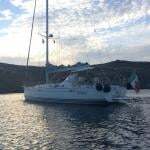 Be that as it may, the man is a real trouper, sailing with a bunch of old mates in true Corinthian style aboard the Farr 42 WOW, a boat they now know better than the backs of their own hands. 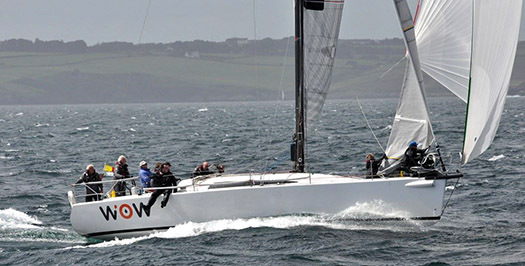 Before Kinsale, they did the race to Dingle, and had their moments of glory in it, their 9th overall in the final placings just behind Anthony O'Leary's Ker 40 Antix being a more than respectable showing. 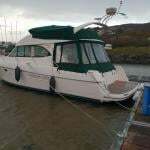 Then over the past five days they've been making the scene in the ICRA Nats 2015/Sovereigns Cup Regatta at Kinsale, and as the breeze built over the four day event, WOW began to come into her own while others fell by the wayside, some with damage which saw their withdrawal. Thus by Saturday morning the smart money was on WOW to be second overall in Division 0. But as the wind piped up still more, overnight leader Crazy Horse (Mills 36, Nobby Reilly & Alan Chambers, HYC) found herself enjoying the going less and less, She was not at all a happy budgie, while the good old WOW just powered around the course as if this was all part of the day's work. And then the last race saw Conor Phelan's Ker 37 Jump Juice put in such a stormer that she not only won IRC going away, but won ECHO in that race too, which is wellnight unprecedented for a boat of this calibre. However, WOW hung in with a scoreline to die for, and suddenly she was the new Division 0 National Champion. It couldn't have happened to a nicer bunch of old salts. Jump Juice jumped into second overall, while Crazy Horse managed to hang onto third, a podium place perhaps, but it was a long way adrift of her expected win. But the boisterous Howth contingent, having had their hopes partially dashed by Crazy Horse's fall from grace even if their dominance in other classes was almost indecent, then found unexpected consolidation when the sea lawyers got to work on the results among the Quarter Tonners, J24s and whatever in Div 4. When things were tidied up, the "corporate" Howth J/24 Kilcullen with her under-25 crew were declared overall class winner. Helmsman was Cillian Dickson, grandson of the legendary Roy.